The April 1st social experiment on Reddit turned out nice this year. Users were enabled to draw on the huge canvas, one pixel per 5 minutes for 72 hours. It resulted in a great example of co-creation. 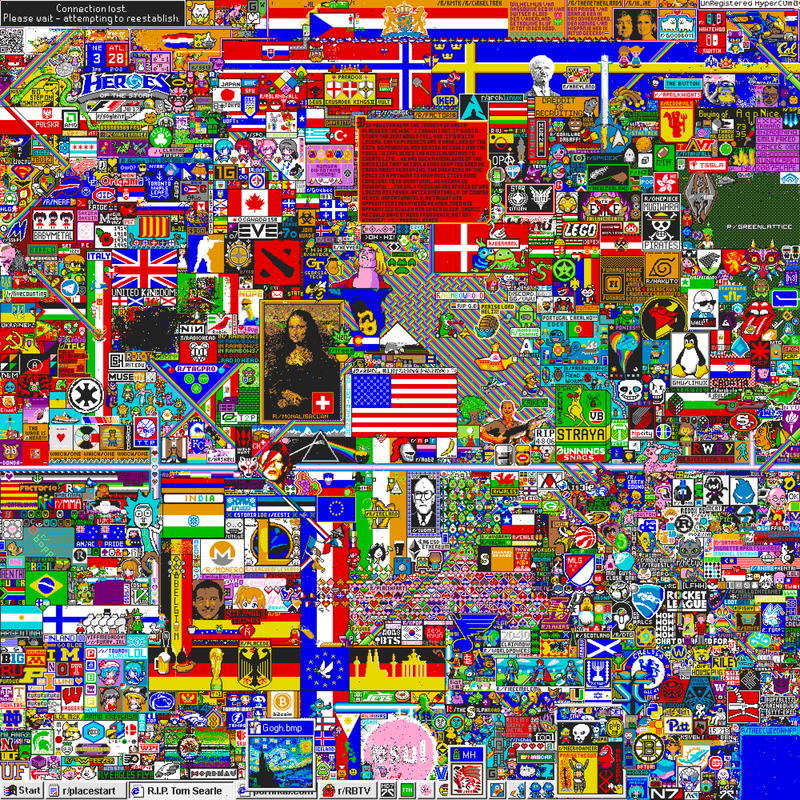 r/place is a collaborative canvas on which a single user could only place a single tile every five minutes. This limitation de-emphasized the importance of the individual and necessitated the collaboration of many users in order to achieve complex creations. Each tile placed was relayed to observers in real-time. The full 1000×1000 pixel picture have already been printed on canvases and puzzles by some redditors. Probably a couple of tattoos will follow. Great detailed description of the project architecture is provided by Reddit on their blog. Absolutely fascinating reading, at peak times 80,000 users were at r/place simultaneously placing tiles. Some users chose to cooperate in creating the art and later, bots were created to draw automatically on the canvas. With the collected data, some wonderful visualisation have been created. You can check the original article here and r/place atlas, I just want to repost some of the animations.